As all dietitians—and perhaps most clients—know, fiber is an essential component of a healthy diet. It’s one of those facts that have been drilled home, even to the general public. High-fiber foods offer many health benefits to people with conditions such as constipation, diabetes, heart disease, and cancer. And they are also important for weight maintenance, adds April Rudat, MS Ed, RD, LDN, a nutrition counselor and speaker. With all of these important benefits, it would seem to be a no-brainer that people should eat a fiber-filled diet. But the truth is that most Americans still don’t get enough daily fiber or remain confused about its best sources. While it’s a great boost to get that added fiber from other sources, whole food sources are still best. “I like to tell clients to ‘think outside the box,’” agrees Rudat. “Some of nature’s best fiber-rich foods don’t come in a box with a Nutrition Facts label.” Sometimes clients need that reminder. 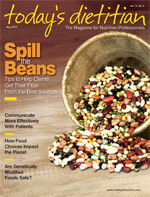 So how do you get your clients to add more healthy fiber to their diets? Often, the biggest roadblock to overcome is clients’ reluctance to try new things, says Zeratsky. Many people get in the habit of eating the same foods week after week. “Getting more fiber may mean being a little more adventurous with food choices,” she adds. To help, we’ve compiled ideas that you can share with your clients—and try yourself. Using the right tips and tricks, even the most stubborn eaters can find healthy ways to add more fiber to their diet. Another aspect of beans that makes them great is that they are easy to work with. Whether canned, frozen, or dried, their preparation is relatively simple. Beans can be easily added to chili, casseroles, and many other dishes. They can even be substituted for meat since they’re packed with protein. Suggest that your clients use one half the amount of ground meat they’d add to their favorite chili recipe and make up for it with red kidney beans. Chef Kyle Shadix, MS, RD, suggests adding legumes such as split peas, lentils, black beans, and lima beans to salsa or puréeing them as a side dish with a splash of olive oil and cracked pepper. He says legumes can also be chilled, combined with fruits and nuts, and served as a salad. Of course, Mexican dishes always call for beans but also tend to be packed with not-so-wholesome ingredients. Seek out healthy Mexican recipes to suggest to your clients or instruct them to prepare their favorite dishes with lower fat ingredients and extra beans instead of meat. For instance, Plotkin suggests this healthy version of a two-bean taco: Mix two of your favorite beans in a bowl. Smash a bit and top with low-fat cheese, salsa, and guacamole. “You’ve got a simple vegetarian taco that’s brimming with fiber,” she says. Offering the right recipe, you can convert even the most obstinate bean haters. Rudat specifically recommends cannellini beans (white Italian kidney beans) to her clients. She created a simple, tasty recipe starring cannellini beans (see below). Vegetables are another obvious fiber-filled food, but sometimes adults can be as picky as children when it comes to eating adequate amounts. Arm yourself with fun recipes and ideas to turn your clients on to eating more vegetables. Again, recipes don’t need to be complex to be tasty. Shadix suggests sautéing leafy greens such as turnip greens, collards, and kale in olive oil and garlic for a simple side dish. Brussels sprouts tend to be one of the more unpopular veggies, but creative preparation can transform them. Shadix suggests sprucing them up by sprinkling blue cheese crumbles and toasted walnuts overtop of a plateful. For those who aren’t fans of cooked vegetables, Shadix recommends sweet corn and points out that the French serve it chilled atop a salad in place of croutons. Experimenting with salads and adding different grains or flaxseeds as toppings is another way to fill up on fiber. Storing precut vegetables in the refrigerator makes them accessible and can entice snackers. Arriving home after a long day of work, many people grab a snack that’s quick and easy; unfortunately, their choice isn’t always a healthy one. But if veggies are already cut into snack-sized dipping sticks, people are more likely to eat them. Encourage clients to experiment with dipping sauces and a variety of vegetables. They can try salsa, almond butter, hummus, and other nontraditional veggie dips. Mixing in and adding vegetables to favorite foods is another way to fortify a meal with fiber. For instance, instead of serving peas as a side to macaroni and cheese, clients can mix them in. Doing so adds fiber to a pasta meal that wouldn’t otherwise offer much nutrition. Using whole wheat pasta makes the dish even healthier. Another simple way your clients can boost the fiber in their diets is switching to whole grain and whole wheat varieties of food. Some people will be opposed to the idea, but again, push these clients to take baby steps. For instance, they can slowly add brown rice to the menu by mixing it with regular white rice. Similarly, tell them to add a little whole wheat pasta to the pot of white penne they have boiling—a small but effective step toward change. They might not even be able to tell the difference after sampling the end result. Plotkin says she recommends that her clients eat whole grain pancakes or muffins for a fiber-packed breakfast. She says simple substitutes can make any baked goods more fiber filled. “For any recipe that calls for white flour, substitute at least 1 or 2 tablespoons of whole wheat flour,” she suggests. Shadix recommends adding high-fiber fruits such as apples and strawberries to cereal and oatmeal or serving them in a bowl with a scoop of low-fat ice cream. They can even be used as a compote for grilled meats, he adds. For the client who is ready to be more adventurous and try something a little different, Shadix recommends adding pearled barley to his or her plate. It can also be added to soups or chilled and used as a base for a salad that might typically have pasta in it. While these suggestions may seem simple, often they are all it takes to encourage your clients to try new foods. An easy recipe that won’t require too much time or effort, especially if the individual is uncertain whether he or she will enjoy the end product, may be the key to success. Offer your clients creative tips and suggestions, as well as information on why a fiber-rich diet is so important, and they will likely make some crucial (and delicious) changes to their diet. Gently mix beans, garlic, and olive oil in a bowl. Top with reduced-fat Parmesan cheese.